The Indian Engagement Ceremony is one of the most important pre-wedding ceremonies in the Indian society. This event marks the beginning of the wedding ceremonies. An Engagement Ceremony is generally held few months before the Indian wedding ceremony. So what do you wear for your engagement ceremony? A sari, a lehnga? Well, both are definitely popular choices for engagement ceremonies. 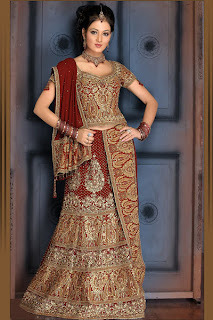 Here are some appropriate bridal lehenga choli designs. If interested in purchasing the designs above, you should email Home India at care@homeindia.com.